It is important to drink throughout the day in order to help maintain your body’s natural balance of fluids and flush your body of toxins. 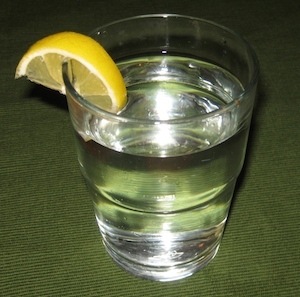 Lemon Water is very alkaline and a great way to boost your alkalinity in the morning. It’s also high in Vitamin A and C. Squeeze the juice of 1 small lemon or ½ of a large lemon into 12 oz of cold or hot water and drink with breakfast every morning. For a little spice, add a dash of cayenne pepper. Decaffeinated Green Tea or Organic Rooibos Tea are both wonderful substitutions for coffee. They are both alkaline drinks and high in cancer fighting antioxidants. It’s helpful to drink at least 12 oz. of one or both of these teas every day. Water is essential for healing as every life-giving process that happens in our bodies happens through water. Water helps clean out toxins; supports normal cell structure and function; is critical for a healthy immune system; and is the main solvent for all foods, vitamins and minerals. Be sure to drink a full glass of water with every meal. Fresh Veggie Drinks are the perfect way to consume concentrated nutrients. You’ll need a good quality juicer. You want a juicer not a high powered blender because your diet will already consist of lots of fiber. The goal here is to drink concentrated nutrients, more per quantity of liquid then you could consume at a meal. There are many on the market in varying price ranges. You’ll want a juicer that is easy to clean and produces dry pulp (this means it squeezes most of the nutrients from the plant products, leaving only the fiber behind). You’ll also want one that provides multiple speeds (slow for softer veggies, fast for firmer ones). Here is a very helpful purchasing guide. Drink a minimum of 16 oz. of fresh veggie juice every day. This can be broken up into two separate juicings. The goal is to work up to consuming all green drinks. However, it will take time for your taste buds to adjust to the flavor as we are conditioned to taste sweet fruity flavors and your body to the intense nutrient levels. If you need to, you may add ½ an apple or extra carrots to all recipes and slowly wean down until you can manage a completely green drink. Here are some sample recipes to get you started. Play around with the ingredients and their quantities until you find what tastes good to you. Try to use only ingredients that are found on the Low Glycemic Alkaline Food List.